I love seeing those three letters together…B…L…T. Especially when followed by the word pizza. We love, and I mean we love pizza. We got the idea for this pizza from one of our favorite restaurants. 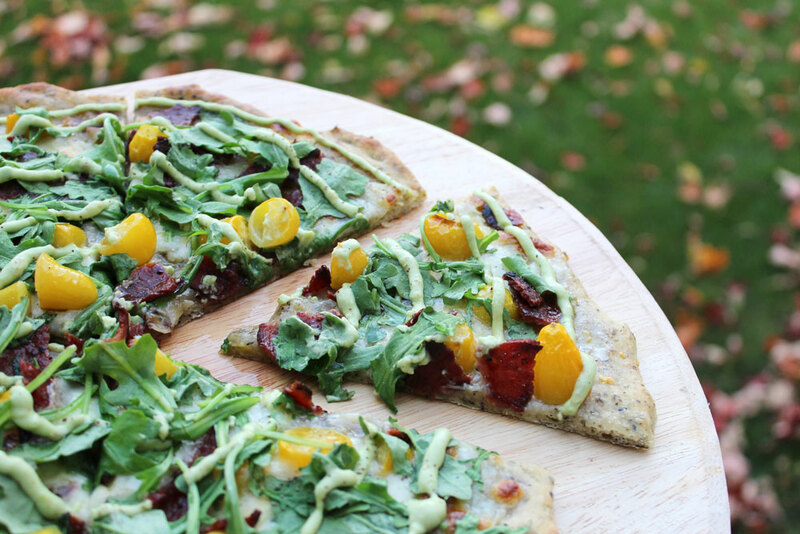 They serve a BLT pizza there and we are absolutely obsessed with it. And, like I have mentioned before, if I try something at a restaurant and fall in love with it, I almost always HAVE TO try making it myself at home. It is fun to be inspired by food that we eat when we go out. *If you haven’t been to Rail Trail before, take this as a strong suggestion that you have to go. They have the most unique menu there, we love it! 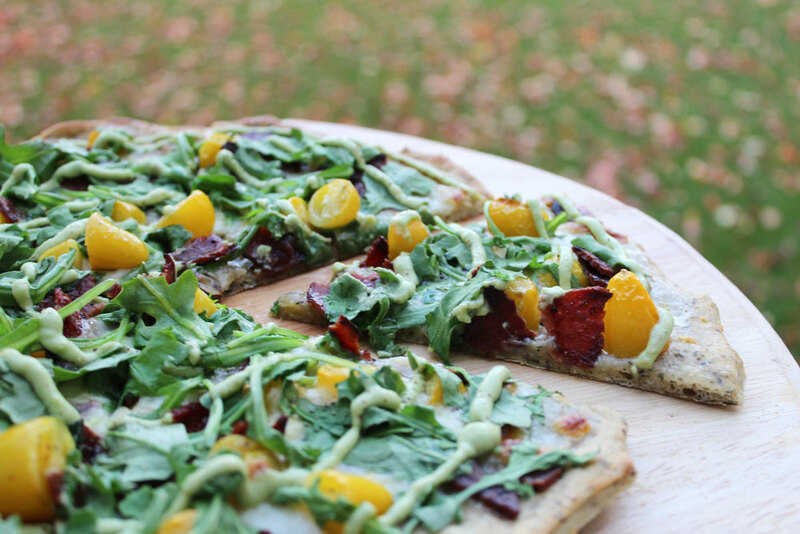 The BLT Pizza that we made uses one of our favorite doughs from Trader Joes, it is called Garlic Herb and it brings so much flavor to the pizza. We also used yellow baby tomatoes that are still growing in our garden. Way to go, garden! We went with turkey bacon as a slightly healthier alternative… And actually, let’s be honest, it’s just cheaper than buying a $5.50 pack of bacon. Plus, there was no greasy mess to deal with! 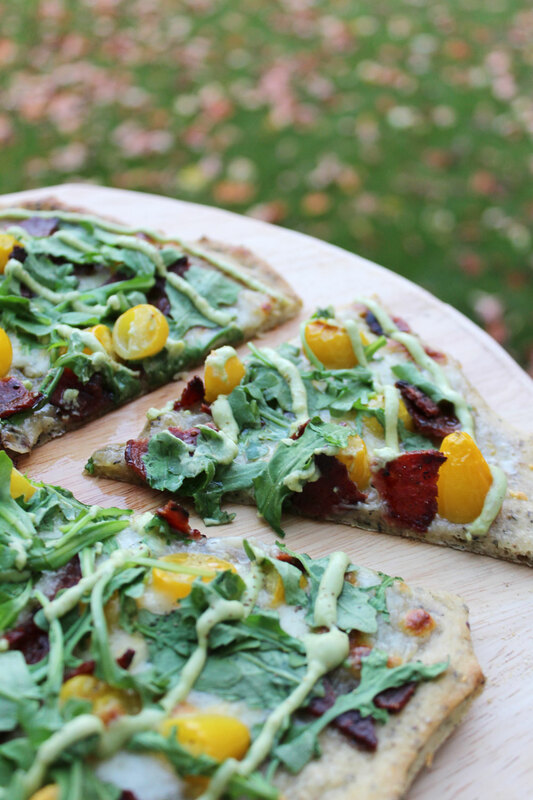 The best component of the BLT Pizza is the avocado, sour cream, lime sauce on top. It is fab-u-lous! This pizza is easy to make, and even easier to devour. 2. Roll out the pizza dough until it is quite thin and place on a greased pizza pan, (we use a sprinkle of corn meal for this). 3. Evenly spread the olive oil and minced garlic on your crust. Top with baby tomatoes, bacon, and mozzarella cheese. 4. Place in the oven for 7-8 minutes, take out and add the arugula, and place back in for about 40-50 seconds. 5. (While the pizza is cooking), whisk together the avocado, lime, and sour cream. Once the pizza comes out, you can evenly spread this sauce.